Our long lazy morning is bed is disrupted by the delivery of a new washing machine but it’s a necessary disruption according to L. They also take the old one away for free as it came from them originally. This is now a legal requirement but I wasn’t sure if it applied in our case as the law wasn’t in place when we bought the last one. I also wasn’t sure they’d remember we bought it from them and if they did, they’d probably deny it. So all in all I was impressed when they rang to tell me although they did try to sell me insurance at the same time. Then sometime in the early afternoon it’s time for a Full English Breakfast, a trip to the paper shop with Doggo and then a walk to the park to meet L and MD. It’s also been an amazing FA Cup weekend. If only all football was this way and if only the big clubs realised how exciting it’s all been. Then in the evening another film amidst an AF night. 'Lion' is based on the novel ‘A Long Way Home’ the true story of Saroo Brierley, as he is known now. We start in Khandwa, India in 1986 with five year-old Saroo (Sunny Pawar) and his older brother Guddo (Abhishek Bharate). They help support their family by stealing coal from trains and general scavenging for items which they then trade. When Saroo manages to persuade his brother to take him on a job at night it doesn't end well. Saroo gets so tired he falls asleep on the station platform where his brother tells him to wait until he returns. When Guddu does not return, Saroo gets on a train that is parked in the station hoping his brother will be on it. When the train moves off not only is his brother not there but there seems no way out of the empty carriage and the train does not stop for anyone to get on until it arrives at its final destination of Calcutta, nearly 1,500 kilometres away. In Calcutta he joins masses of other homeless children as he cannot get anyone to help him because they speak Bengali and he only speaks Hindi. Someone eventually takes him give, giving him food and shelter but Saroo flees when he rightly senses that they have unpleasant plans for him, mostly likely being sold into prostitution. Then he is rescued a second time and placed in an orphanage. The staff attempt to locate his family but Saroo cannot correctly name the place he is from and does not even know his mother's actual name. As they can’t return him home he is instead adopted by a Tasmanian couple, Sue (Nicole Kidman) and John Brierley (David Wenham) and he grows up with them in Hobart along with another adopted but emotionally disturbed Indian boy Mantosh (Divian Ladwa). 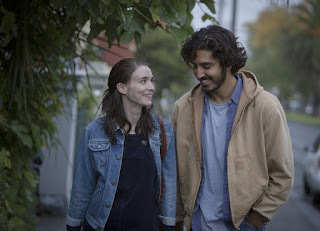 Twenty-five years later, and totally Australised, Saroo (now Dev Patel) heads off to University to study Hotel Management where he even bags himself an attractive girlfriend in Lucy (Rooney Mara). However as flashbacks to his early years surface in his mind he begins to wonder about his past. One of his student mates tells him to trace his home town on Google Earth which at first he doesn’t take seriously but an obsessive need to trace his origins soon takes hold, disrupting both his career plans and his relationship with Lucy. To be fair Hotel Management was probably giving Dev unsettling flashbacks anyway, all the back to the Best Exotic Marigold Hotel. Of course, looking for your home town when the town name you have in your head doesn't exist is akin to looking for a very small needle in the very large haystack that is India and he spends many months starting at railway lines on Google Earth looking for something he recognises. It’s all very sweet, if a bit of an advert for said Google Earth, but I don’t really get all the angst. Why does he shut everyone out? We did he not let his Uni mates help him or his girlfriend or his family and when he finally traces his home in India he goes out there alone. Overall it’s decent enough film that ends with actual footage of Saroo being reunited with his mother. Dev Patel has bagged himself an Oscar nomination for his role but it has to be said the real star is Sunny Pawar who puts in an extraordinary performance as the younger Saroo. By the way Saroo, or Sheru as it actually is, means Lion.